Kagome felt her face bust into flame as the demon Lord exited the spring, revealing all his ethereal perfection. Her mouth opened and closed but no sound came out. Her eyes as wide as saucers, she couldn't force herself to look away for the life of her. His body was lean and muscled, a sleek elegance to it like a feline. His sharp eyes were like polished gold as they fixed on her, their depths holding a predatory glint. Instinctively she backed away. Holding her hands together, she bowed her head and stammered, "O Kami... I'm s-s-so sorry! I didn't know you were using the hot spring-"
"Quiet." His deep voice cut in smoothly. She froze. Anxiously, she watched the daiyoukai glide towards her, trying to not look down between his thighs at the rest of him. She almost choked on her tongue when he stopped just a foot before her. He dripped, the water droplets hugging his flawless form greedily. Her whole body shook. 'O my God... how did this happen? Actually, why is this happening. I can't believe this - he's going to kill me in the buff.' She mentally moaned. She went rigid when she heard him say from above her, "Your apologies are not enough for intruding on my lands, miko." Slowly she looked up into the inu youkai's stunning face. He looked down at her stoically, his pale features stony yet so beautiful she almost winced. "E-Eh..." The girl replied dumbly. Those gold orbs flashed with a deadly intent. 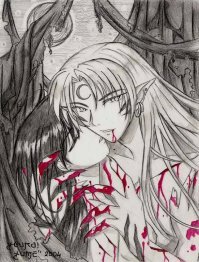 Feeling a hand cup the bottom of her chin, Kagome almost fainted then and there when she saw that gorgeous face start looming towards her. Her heart beating frantically and feeling the desire to scream and swoon, she felt her face become blazing hot when those pale lips hovered before hers. She could smell his fresh scent, his overwhelmingly powerful presence encasing her, causing her knees to knock together. Then, in a swift, sensual movement, his lips were on hers and the world stopped. Ieeeeeee! I love it, sooo cute !!!!!!! ^w^ Great work! Ugh, why are you so talented?! I practice and practice but all my art looks like it was drawn by a three year old. You really captured his intense expression and I love the little oneshots you write to accompany your drawings- it gives them added depth. Gorgeous, as always. Rinku one of these days we will get you to stop bashing your work....this is an awesome little clip, and the story to go with it makes me thing Kags is going to have some very naughty things done to her in the very near future >;D...I love it!! There is just simply not enough words to describe how amazing this is. Like O.O WOW!!! I LOVE IT!!!! This is why I am a huge fan of yours! Not only do you draw such amazing works of art with the detailed expressions you give your characters, but you also offer a short storyline behind your pictures. It really gives a powerful impact. Love it! I love your work Lord R! The picture and the story.